"My love of the monstrous and magical led me beyond the confines of natural appearances into unreal worlds." "No pen or drawing can convey this country." "There are places, just as there are people and objects... whose relationship of parts creates a mystery." "I am no longer an artist ... I am a messenger." "I believed that by a process of what I can only describe as inward dilation of the eyes I could increase my actual vision." 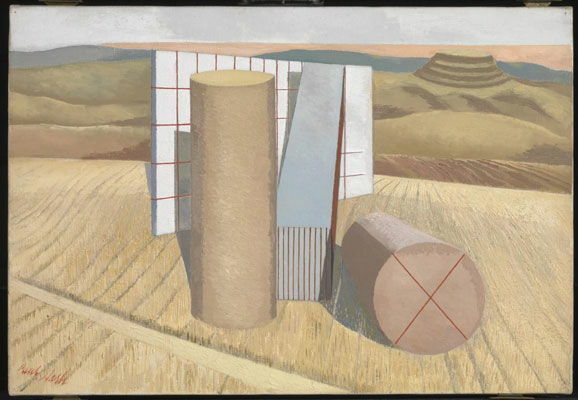 Paul Nash was born in Kensington, London in 1889. He was the son of barrister, William Henry Nash and of navy captain's daughter, Caroline Nash. He was the eldest child, and brother to John (also to become a very accomplished and well-known artist) and Barbara. When Paul was only three years old, his family moved to the Buckinghamshire countryside in an attempt to benefit his mother's deteriorating mental health. The financial cost of his mother's treatment (which included long spells in a hospital) necessitated that the Nashes rent out their family home, during which time Paul and his father lived together in smaller accommodation whilst his siblings attended boarding school. Sadly, the family's efforts were in vain. Nash's mother did not recover and died when the artist was in his early teens. As a child, Nash was described as "ill at ease in the world". He enjoyed escaping his strained reality through avid reading and retreating to secluded parts of the Buckinghamshire countryside. Already from a young age, Nash was very inspired by nature, and in particular, by trees. He described the trees in the garden of his family home as "Hurrying along stooping and undulating like a queue of urgent females with fantastic hats". Via such ideas he attributed an anthropomorphic quality to nature, an idea that he often returned to in his mature paintings. Sadly, school life was also difficult for Nash. He failed to excel in any of his subjects and said that he generally felt "misery, humiliation and fear". He failed to pass the Naval Entrance Examination which led him away from his intended career (following in his grandfather's footsteps) and instead, a fellow pupil at his school encouraged him to consider a future as an artist. Initially, this was a novel idea, for Nash had come from a family for whom art appreciation, according to the Times Literary Supplement, "hadn't meant much more than pinning Paul's and John's watercolour squiggles on the walls." In 1906, Nash began attending the Chelsea Polytechnic, now Chelsea College of Art. Two years later, he moved to the London County Council School of Photo-Engraving and Lithography, a study environment that he enjoyed and described later as 'ha[ving] an atmosphere of liveliness and work." Here, students learnt the practical skill of how to make a living producing posters, layouts, and bookplates. During this happy and productive time, Nash's landscape drawings caught the eye of painter and printmaker William Rothenstein, who championed the young artist and suggested that he enrol at the Slade School of Art. Of his first meeting with the Slade tutor Henry Tonks, Nash wrote "It was evident he considered that neither the Slade, nor I, were likely to derive much benefit". Indeed, Nash did not do well at figure drawing and as such Tonks, unlike Rothenstein, did not appreciate Nash's talents. As a result of this conflict with a senior tutor, Nash left the Slade within a year, parting also from the influential generation of artists alongside whom he had begun to study including Stanley Spencer, Mark Gertler, David Bomberg, C. R. W. Nevinson, and Dora Carrington. Nash returned to Buckinghamshire at this time and began a series of landscapes and tree studies, often set at night. He discovered a new natural site, the Wittenham Clumps, a wooded area near his uncle's house, and this became a subject to which he would return again and again. 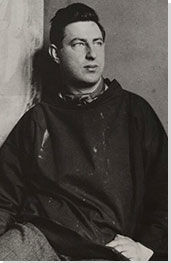 By the time of his return to Buckinghamshire, Nash's younger brother John had also started to paint landscapes, and the two showed their work together in the early 1910s. Nash also used this time to experiment with different painting techniques, including watercolor and more illustrative, graphic styles. When WWI broke out in 1914, Nash joined the Artists' Rifles Brigade. In the same year he married Margaret Odeh, a campaigner for Women's Suffrage, but it was not long before he was sent to the front. There, Nash was "exhilarated by the sense of purpose" and made several sketches. At the hand of fate, he was sent home with injured ribs (having fallen into a trench) before seeing any action. A few days after being sent home as an invalid, the majority of his remaining unit were killed during a surprise assault and as such from this point onwards, Nash felt extremely lucky to be alive. Having made multiple sketches that impressed people upon his return home, Nash, along with his brother, John, became officially employed as war artists. Void (1918) is one of the many images of the misery and destruction of Nash's experience of World War I. When Nash had recovered his broken ribs and returned to the front to glean images of the conflict, his experience changed entirely and he no longer felt an invigorated sense of purpose. This time round, Nash was frequently subject to shelling and heavy bombardment and started to describe the war as "unspeakable, godless, hopeless". He felt uncomfortable in his position as an official war artist, and wrote home, "I am no longer an artist... I am a messenger to those who want the war to go on for ever ... may it burn their lousy souls." In spite of this, he did his best to get as close as possible to the action so as to make "fifty drawings of muddy places", which would go on to inspire many of his future paintings. On his return home for the second time, this time at the end of the war, Nash started to work his drawings into oils, with the first wave of notable paintings including We Are Making a New World, The Ypres Salient at Night, and The Menin Road. These three paintings were all exhibited at the "Void of War" exhibition in 1918 and established Nash as a highly significant artist in general, and more specifically, as the authority on the presentation of war-torn battlefields. 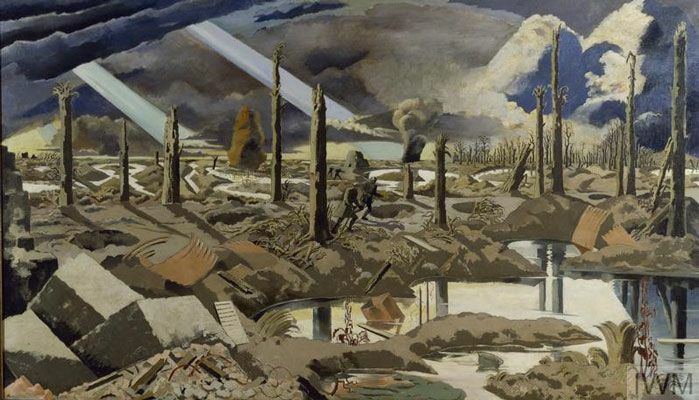 Critics praised Nash's "dignified rage" and greatly admired the way he captured the unusual and eerie atmosphere of No Man's Land. In spite of his success as an artist, Nash's physical and mental health were both badly damaged as a result of the living conditions in the trenches. In 1921, he spent a week in a hospital, mostly unconscious, going on to make a series of pictures of the. During this time - a time of recovery from trauma - Nash also explored other modes of artistic expression including theatre design, bookplates, textiles, and wood engraving, and also worked as an art teacher. Whilst acting as a tutor at the Royal College of Art, two of his notable students included Eric Ravilious and Edward Bawden. Nash's career continued with successful exhibitions at the Leicester Galleries in 1924 and 1928. These shows demonstrated Nash turning away from landscapes and beginning to explore abstraction, often combining these two interests. In 1929, he travelled to Paris with his friend and fellow English painter Edward Burra, where the two met Max Ernst and Picasso. 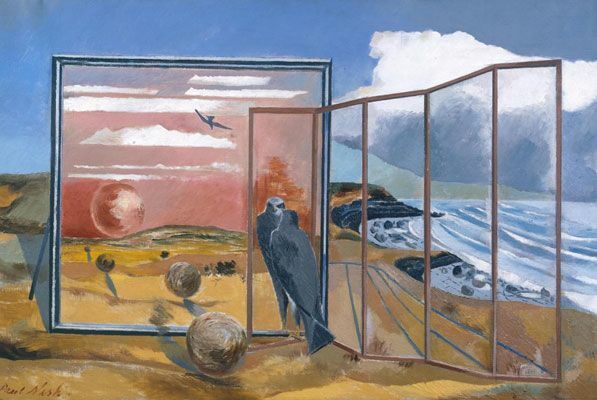 This trip inspired Nash to explore Surrealism as a useful language through which to highlight the mysterious and spiritual aspects that he already felt strongly within landscape. Indeed, from this point forth, Nash became a pioneer of Modernism, Abstraction, and Surrealism, founding the Unit One movement in 1933, which greatly helped to revitalise British art during the interwar period. Unit One came together with the support of his friends and contemporary fellow artists, Henry Moore, Barbara Hepworth, and Ben Nicholson, among others. Between 1934 and 1936, Nash lived in Dorset, where the sea air was thought to be good for his asthma and he worked on producing a guidebook for the area. In his article Swanage or Seaside Surrealism (1936), he described the area as having "a dream image where things are so often incongruous and slightly frightening in their relation to time or place." It was here that Nash identified most closely with Surrealism, experimenting with found objects and starting an affair with fellow (married) artist Eileen Agar, with whom he collaborated on several works. The affair was passionate and long-standing, starting in 1935 when the two artists met and only ending in 1944. All the while both figure remained married to their respective partners. When Agar ended this relationship, possibly because she had started a new love affair with Paul Éluard, Nash was reportedly devastated and moved back to London with his wife. Nash has referred to himself as a "gentle minded creature" and as such it was very difficult for him to reconcile within himself the idea of going to war. He was also an intensely curious personality and was generally attracted to strong and unusual women. Before marrying a suffragette and falling in love with the sexually liberated Agar, during his art school days, Nash was immediately drawn to and became great friends with the highly eccentric Dora Carrington. When WWII began in 1939, Nash was considered too ill to fight but was once again appointed as an official war artist by the War Artists' Advisory Committee (WAAC). As a long-standing aircraft enthusiast, he was fortunate to be working with the Royal Air Force and Air Ministry. However, officials were generally wary of his imaginative and anthropomorphic depictions of planes, and it was only thanks to the intervention and financial support of chairman of the WAAC, who was also the renowned art historian Kenneth Clark, that he was able to continue painting. Clark's support gave Nash the artistic freedom he needed to continue making his surreal depictions of aerial conflict. His paintings became increasingly abstract, culminating in the Paul Klee -esque Battle of Germany (1944), Nash's final work for the WAAC. 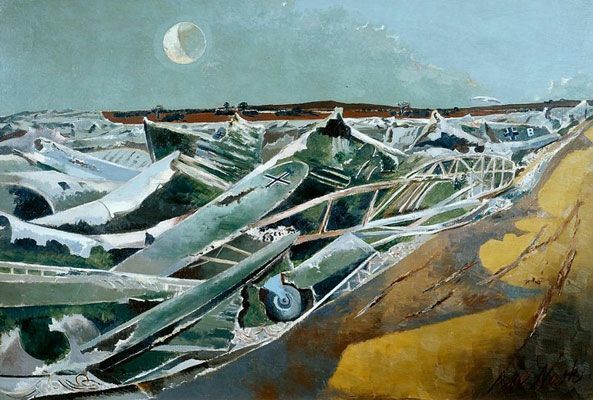 Nash's WW II paintings are amongst his best known; in particular Totes Meer, Battle of Britain and the aforementioned Battle of Germany, which show war-torn landscapes and mangled machinery, yet always remain mythical or dreamlike in appearance. 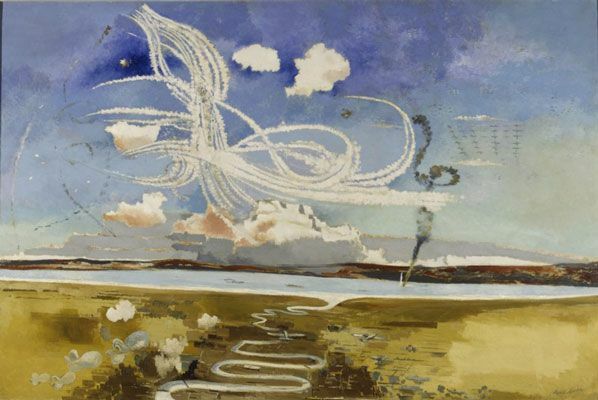 During periods in which he was unable to paint due to depression or asthma (for example after completing Battle of Britain), Nash produced photographic collages using motifs from previous works, and often accompanied by images of Hitler. 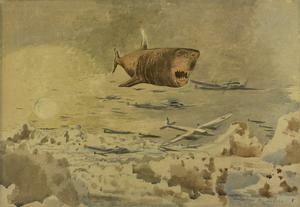 He even personified Hitler as a (a particularly mean) flying great white shark in one of his collages made during this period. The Ministry of Information declined to use these controversial images as propaganda, despite Nash submitting a whole series called Follow the Fuehrer for this very purpose. From 1942 onwards, Nash made regular visits to the home of artist Hilda Harrison. These trips were both creative and recuperative for the artist. The country air was thought to benefit his health, and from Harrison's home he once again had a good view of the Wittenham Clumps, the landscape that had so inspired him as a child. Following the completion of his last work for the WAAC, Battle of Germany, in 1944, Nash spent the next eighteen months in "reclusive melancholy". He died in his sleep on 11 July 1946 of heart failure - a result of his long-term asthma. He was buried in Buckinghamshire, and the Egyptian stone carving of a hawk that he had painted in Landscape from a Dream (1936-8) was placed on his grave. A memorial exhibition and concert were held for the artist at Tate in 1948 and were attended by the Queen (the wife of King George VI and mother of Elizabeth II). Throughout his career, Nash (quite accurately) saw himself as successor to J.M.W. Turner and to William Blake. Like these inspirational figures before him, he attempted to capture the "spirit" of the English countryside, and according to curator Jemima Montagu, "was able to develop a unique form of expression which evolved out of, and yet has come to define, an idea of the English landscape". This skill was particularly marked in his work as a war artist, a role he was instrumental in shaping. 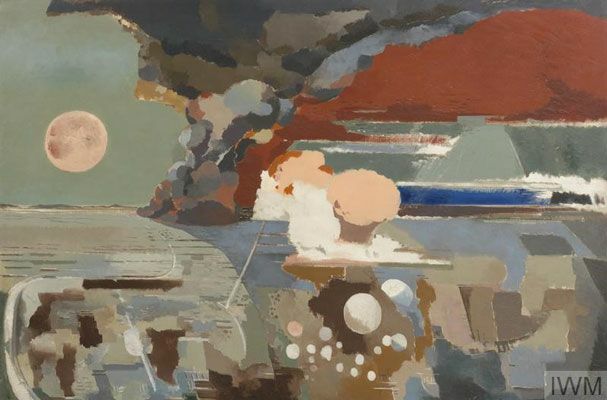 A soldier as well as an artist, Nash's paintings are strikingly honest about the devastating effects of war and particularly its impact on the landscape. For artist Alice Channer, Nash's work resonates strongly to this day. She writes, "Here we are, nearly a century later, looking out at identical and vast landscapes of industrial destruction ... Nash's war landscapes give us some idea of how we got here." 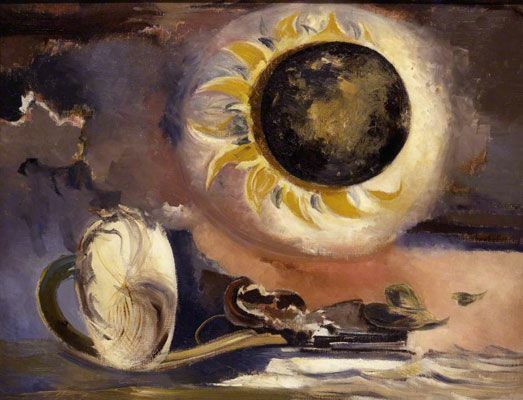 In the Tate retrospective that followed his death, Nash was celebrated for his war art, for his landscapes, and for his affiliation with Surrealism. It is the first two associations that Nash is perhaps best known, although it is important to remember that Nash also produced prints, engravings, lithographs, books, fabrics, rugs, glass, ceramics, and interiors. Tate's assistant curator Inga Fraser draws attention to the range of Nash' influences and output, stating "Nash's modernism was generous and inclusive" and goes on to cite a notebook in which the artist kept lists indicating the diverse references from which he drew. One such list reads "Cézanne, Cubism, artificial pattern, bricks, mosaics, stones, tiles, machinery, Léger, photography, hieroglyphics, block printing, cloth making, and film, natural forms... miscellaneous fireworks, sign, lighting... Woolworths." Indeed, Nash's artistic career could be said to be full of surprising contrasts. As arts writer Marta Maretich points out, it is ironic that his most famous works, showing the horror and destruction of war, were funded by governmental organizations, the War Propaganda Bureau and the Ministry of Information, the very institutions that he struggled with ideologically as overall he did not agree with or understand war. It is perhaps for this reason that - although Nash rarely received a bad review of his work in his lifetime - Nash seems to have posed a challenge to critics. 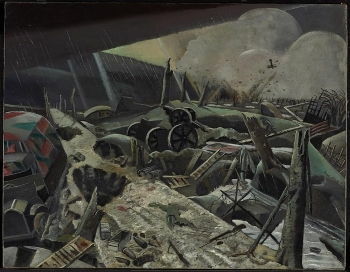 Even the highly sympathetic Chairman of the WAAC, Kenneth Clark expressed both admiration and confusion at Battle of Germany (1944) whilst the BBC correspondent, William Cook noted that "Nash's [interwar] art was saved from academic introspection by the outbreak of the Second World War". Similarly, the artist Geoff Hands contrasts Nash's "fairly conservative persona" with his interest in Surrealism, Cubism and abstraction, a comment that perhaps characterises why Nash's "official" war work is both somewhat subversive and intriguing. Ultimately we are confronted by the typical English artist paradox, that of living and working as a "subtle radical". Having returned from his service in WWI with many watercolors and pastel sketches depicting the landscapes he had seen, this is one of Nash's first oil paintings, based on the drawing Sunrise, Inverness Copse (1918). 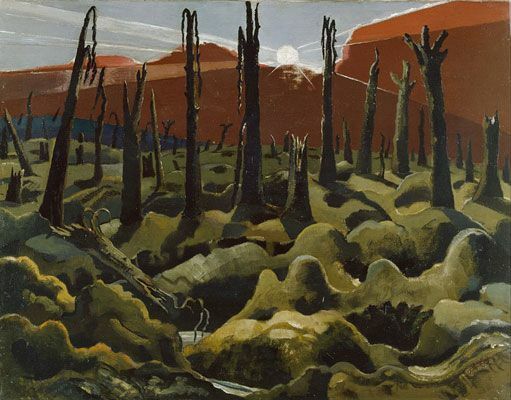 Both his drawing and painting that followed depict the war-torn Western Front, where the trees have been burned or beaten away and the earth has become scarred and undulated by shell holes. There are no people, but the tree stumps have an eerie human presence. Indeed, the trees are either personified or they stand as gravestones for the men no longer standing there themselves. Despite a tone of pessimism and a scene wrought with destruction, the sun beats down and continues to illuminate this land. This light works on two levels; it shows a glimmer of hope that Nash cannot let go of, but also introduces a tone of mockery with regards the purpose and intent of war. The latter rings particularly true when considered in respect to the title of the work - We are making a new world - which acts both as a parody of the naive ambitions of war and as a description of how the landscape has been subjected to such destruction that it is almost unrecognisable. Former curator at The Imperial War Museum, Roger Tolson, affirms "In Nash's bitter vision the sun will continue to rise each and every day to expose the desecration and to repeat judgment on the perpetrators. This new world is unwanted, unlovable but inescapable." This work is generally considered to be one of the most memorable images of the First World War and has been compared to Picasso's Guernica (1937) - the Spanish Master's legendary response to the bombing of the eponymous town. Nash poignantly subverts the usually peaceful and picturesque English landscape tradition and introduces a new element of horror. As such, the painting well embodies his comments of the previous year with respect to his role as a war artist: "I am a messenger who will bring back word from men fighting to those who want the war to last forever." This message, he claimed, would reveal the "bitter truth" of war. First published on 20 Dec 2018. Updated and modified regularly.